On Friday when my son called, he asked if we could come over Sunday for a visit. He had an ulterior motive though. He wanted the Pres and I to help him trim a few of his trees which meant that the Pres would bring his chain saw and pole saw. When it comes to those small engines, there's no need to ask twice with the Pres. So Sunday it was. Mia also had a request for me. "Nana, can you make me banana bread with chocolate chips and NO nuts?" No need to ask Nana twice either. Consider it done! And in return, we not only got our fill of pancakes, sausage and fresh fruit for breakfast, we got this as well! Do you know how good it makes me feel when Mia is so excited to see us...to spend the day with us!!!?? I don't think I'll ever stop saying it's so good to be home!!! Mia is a doll baby for sure.. what a smile... and my hubby would love to crank up the saws or anything that has a motor on it. Nice your are needed to bake a Banana cake and oh yes the Grandkids tell you what they dont like in it. Ha,ha. Been there and done that. Sounds like a deal to me...and just like Dorothy says..."There's no place like home." she's so cute! and growing UP! Mia is growing up! Still just so sweet though and of course you would go and help and enjoy her and your family. Your grandaughter is darling! I'd rather have chocolate chips instead of nuts any day! Mia is precious! So pretty! That's great that you can spend the day with her. 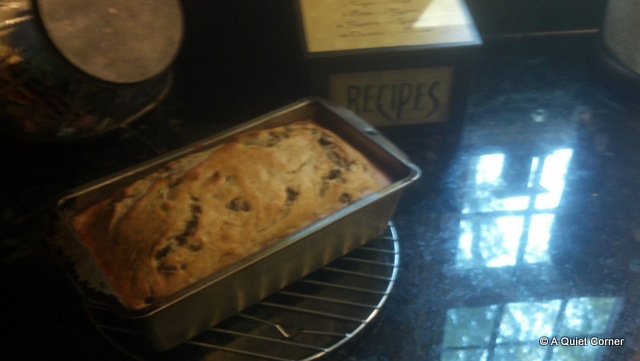 She is a doll and I never thought about putting chocolate chips in the banana bread - how did I miss that?